November is one of my favourite months of the year to Fish out of the Marina Pez Vela, here in Quepolandia. After the rains of the past few months, our afternoon rains should start to subside as the month progresses, water temperatures will start to warm back up again and the volume of baitfish in the area increases both Offshore & Inshore bringing the hungry predators with them. We have enjoyed some incredible fishing over the past few months. 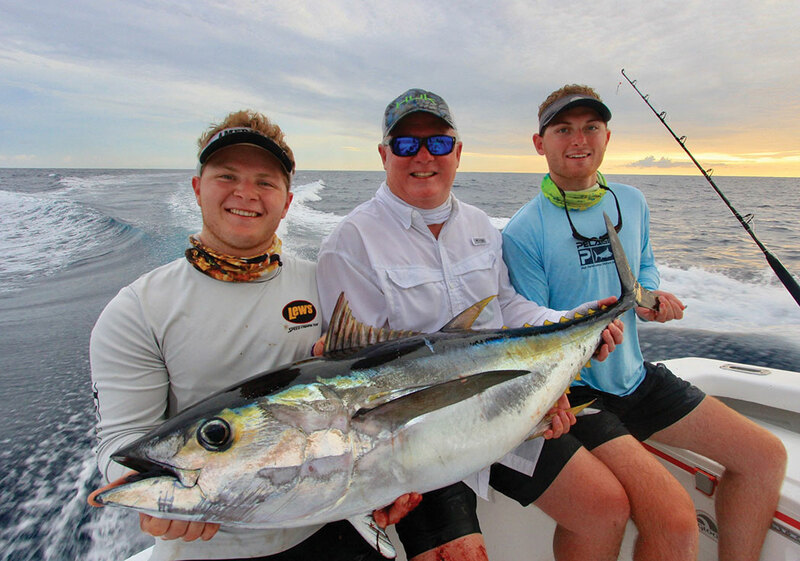 Blue Marlin, Sailfish, Dorado and Tuna have all been getting caught in good numbers with some weeks producing excellent fishing and opportunities to catch all of these species just 20 miles or so from the Marina. We have had an awesome Dorado bite this year which should peak during November, just in time for the Dorado Derby here at the Marina Pez Vela on November 17th! This tournament really is open to all, tourists, locals, expats, professionals, novices, ladies, kids— all are welcome! It’s still not too late to get your entry in to what is the most accessible Sport Fishing Tournament in Costa Rica with a team entry fee of just $250. It is going to be one epic weekend as competitors battle it out in the search of the largest Dorado. If recent catches are anything to go by, Anglers could be in for a real treat, as there have been some HUGE Dorado caught these past few months with several Quepos boats catching 70lb plus Dorado, which is just huge for this species. 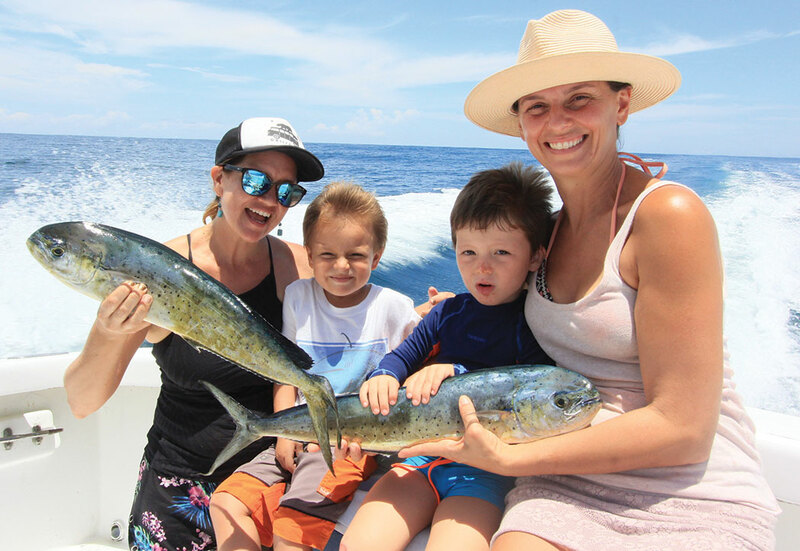 At this time of year we often get some great Dorado fishing less than 10 miles from the marina and when the fishing is like this it is perfect for a half day Offshore family trip with the kids. Further Offshore in the 25-40 mile range Captains will be searching for mega pods of Spinner Dolphins that the Yellow Fin Tuna accompany. 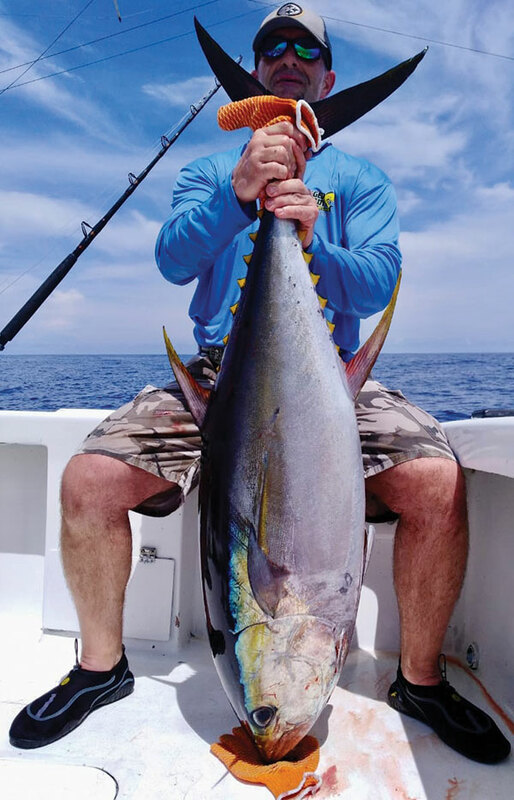 Bucktail jigs, tuna bullets, bass worms and similar artificial lures typically produce Tuna in the 20-60lb range whilst livebait is the preferred method for the larger fish with 80-100lb fish common and the occasional WICKED TUNA sized fish landed! There should be good numbers of Sailfish during Offshore trips and double-digit releases can be possible if your captain finds a good concentration of fish. If you want to target Marlin, November through January are perhaps the best months of the year to catch a Marlin during day trips out of Quepos. Blue Marlin in the 150-300lb range are the most common at this time of year, however, there will be some Striped Marlin mixed in and Black Marlin can be targeted over the Offshore Reefs. Our Inshore fishing was a little slow during the past couple of months due to the seasonal rains but as water visibility increases over the next month you can expect some excellent Inshore fishing. Roosterfish, Snook, Mackerel, Jacks, Corvina, Cubera Snapper, Tripletail plus lots of other species can all be caught during Inshore trips out of Quepos. 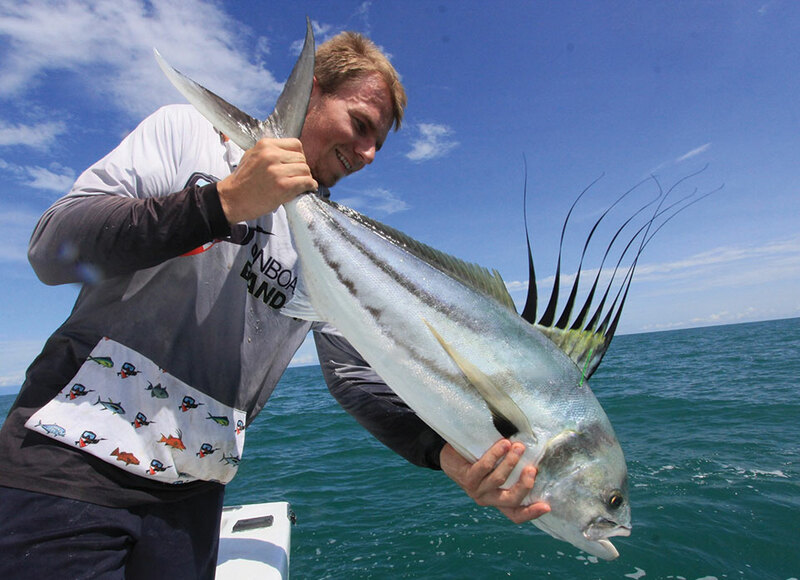 A slow trolled live bait using medium weight spinning tackle is the preferred method for Inshore fishing here or you can try your hand at casting poppers and top water lures which can provide some epic visual fishing. 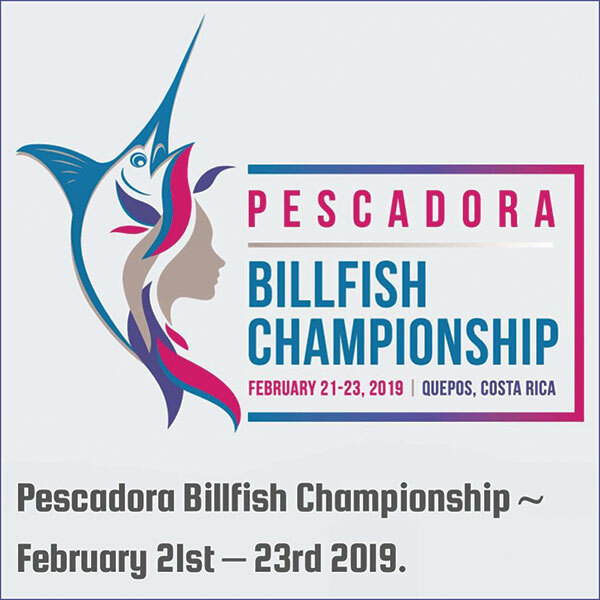 We are super excited about the LADIES ONLY Pescadora Billfish Championship which will take place on February 21-23. This event is for ladies and organised by ladies and promises to be the weekend of a lifetime for the lucky girls who will take part. This is a Catch & Release Billfish tournament with points awarded for the successful release of Sailfish & Marlin. In addition to the prize for the team who releases the most Billfish, there will be awards for the heaviest Tuna & Dorado as well as the top lady Anglers in each division, hook your own fish for the more experienced Anglers or crew assisted catches for the less experienced. Some incredible boats and teams have already registered for the event but there are still some great boats available for charter. So come on ladies, grab your girlfriends, think up a cool team name and come and join the party this February at the Marina Pez Vela! World class fishing, champagne fuelled dockside parties, live music, a yoga morning, a Mimosa pool party, and a White-themed awards banquet to wrap things up, it promises to be one awesome weekend and I hope to see you there!